Jennifer Read Hawthorne, beloved coauthor of the #1 New York Times best seller Chicken Soup for the Woman's Soul, and Barbara Warren Holden, interviewed young women on their biggest life challenges. They then sought the wisdom of experienced women to address these "new century" problems. The result is this exquisite book, offering eclectic wisdom from older women to their younger counterparts on a variety of life issues. When women reach certain rites of passage-going to college, getting married or having a baby-they become mindful of their mother's advice and come to appreciate the life experiences of more mature women. 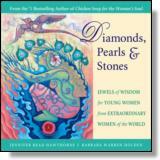 In fact, when interviewed by the authors, young women specifically expressed a desire for older mentors, so Hawthorne and Holden answered them through the words of society's most successful and wise women-mothers, doctors, writers, activists, therapists-and included inspiring advice from celebrities like Oprah Winfrey, Hilary Clinton, Janis Joplin and Barbara Walters. Some chapter topics include: Living in Your Body, Transforming Your Emotions & Trusting Your Feelings, Awakening Your Creativity, Discovering Your Destiny, Finding Your Tribe and Accessing Authentic Female Power. Jennifer Read Hawthorne is coauthor of four New York Times bestsellers: Chicken Soup for the Woman's Soul, Chicken Soup for the Mother's Soul, Chicken Soup for the Single's Soul and A 2nd Chicken Soup for the Woman's Soul. She is an inspirational speaker who lives in Fairfield, IN. Barbara Warren Holden teaches yoga and has facilitated women's circles in the U.S. and Costa Rica. She lives in Louisville, Colorado.